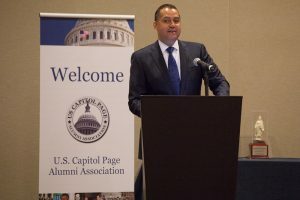 Don Peebles, House ’78, told a crowd of almost 200 Pages and friends how he felt his experience as a Page instilled the life lessons necessary to become one of the most successful real estate entrepreneur in the nation. Pebbles was keynote speaker at the USCPAA Homecoming Gala on May 28 in Washington, D.C., and was introduced by classmate Dr. Duane Taylor. “Real estate is highly regulated and is deeply rooted in politics,” he stated. “The skills I learned on Capitol Hill and the relationships I fostered there – including former Rep. Ron Dellums (D-Cal. ), Rep. Charlie Rangel (D-NY) and Rep. John Conyers (D-Mich.) have been applied in every expansion of my company into nine major U.S. cities.” Pebbles noted with pride his ongoing professional relationships with all three men and that he chairs the Foundation Board of the Congressional Black Caucus, of which Rangel and Conyers are members. 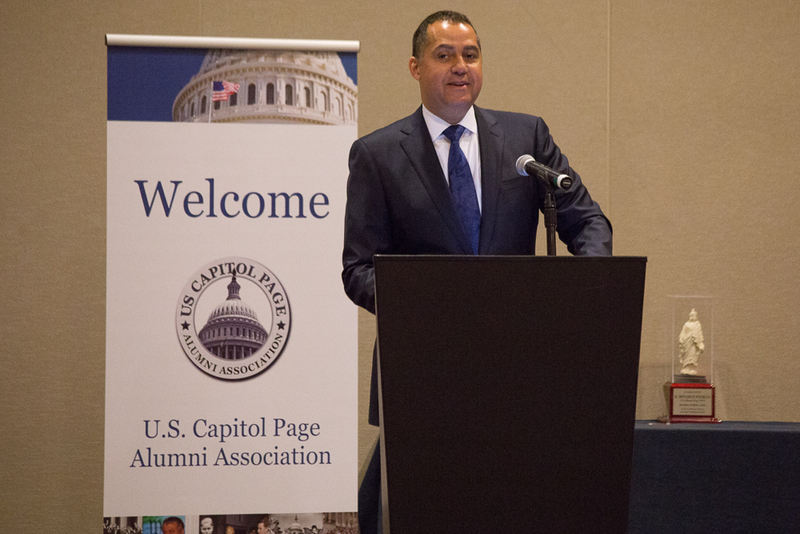 Peebles related how he came to Capitol Hill from a D.C. public high school, the son of a single mother who was a secretary and a father who was a low-level government worker and part-time auto mechanic. “I was given an opportunity to serve as a House Page for six months. I found myself attending school not in a D.C. neighborhood but on the top floor of the Library of Congress with a view of the Capitol and the Supreme Court. THAT was one heck of a journey. Suddenly, the perceived barriers and limitations I had previously faced were gone. I approached my ‘new’ life with a sense of limitless goals!” Pebbles said he was driven to find a way to stay on Capitol Hill and secured two internships and another full-time position to keep him at Capitol Page School through his senior year. The lengthy, demanding and often unpredictable Page schedule, Peebles says, trained him in time management, discipline, responsibility, integrity, building long-term relationships and honor. At CPS he was so focused that when he later enrolled at Rutgers, he was bored and left within a year to start his real estate career. Peebles challenged the former Pages and their families to help bring back the House Page program. R. Donohue Peebles is founder/Chairman/CEO of The Peebles Corporation, a privately held real estate investment and development company with a multi-billion dollar portfolio of projects in New York, Washington D.C., Philadelphia, Boston, Miami and Miami Beach. He is the author of top-selling books The Peebles Principles and The Peebles Path to Real Estate Wealth, and a regular guest on CNN, CNBC and FOX. He is an avid supporter of mentoring to expose young people to the value of entrepreneurship, and an active supporter and fundraiser for both political parties at the local, state and federal level. 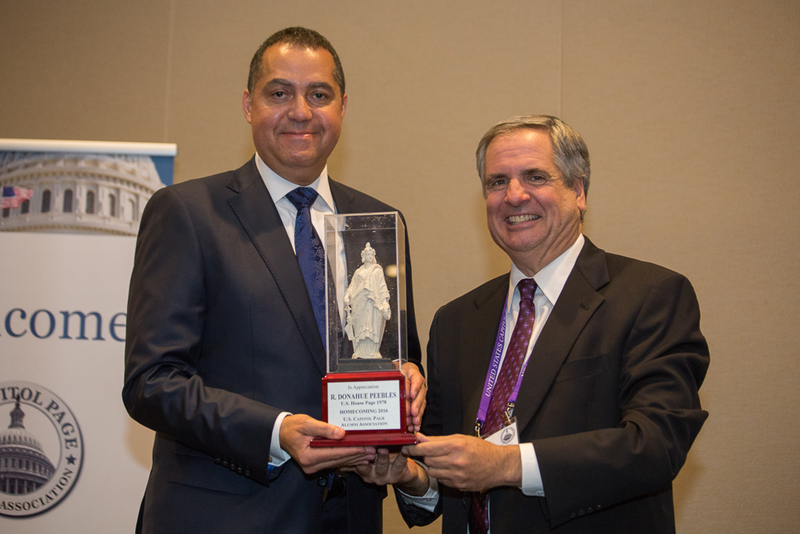 Peebles is the Chairman of the Board for the Congressional Black Caucus and served on the National Finance Committee of President Barack Obama. 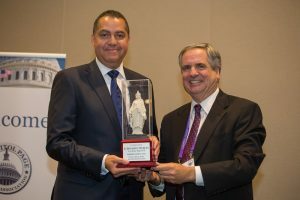 He serves on the Board of Directors of the YMCA of Greater New York, is a member of Miami-Dade County Mayor Gimenez’s Business Roundtable and is a former Chairman of the Greater Miami Convention and Visitor’s Bureau.